When developing a business plan for an E1 Treaty Trader Visa a business plan writer should be sure to follow all of the criteria set forth by the United States Citizenship and Immigration Services. The E1 Treaty Traders Visa is a non-immigrant classification that allows a person of a treaty country, in other words a country in which the United States maintains a treaty of Commerce and navigation, to be admitted into the U.S. solely to engage in international trade on his or her behalf. The purpose of a business plan to supplement the application for an E1Visa. In order to apply for an E1 Visa an applicant must file form i- 129 with the Citizenship and Immigration Services office of the United States of America. In order to qualify for a Treaty Trader Visa, or what is called an E1 classification Visa, the person must be a National of a country that has a treaty agreement with the United States and carry on substantial trade between the US and the treaty country which is qualified as a treaty trader for the E1 Visa classification. 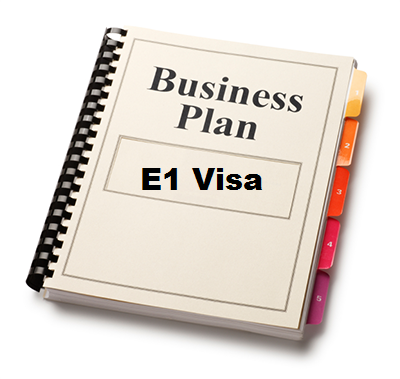 The business plan writer developing the E1 business plan to supplement the application should be sure to explain how all of these qualifications are met in the E1 Visa business plan. Also, when developing an E1 Visa business plan, the business plan writer needs to make sure that they (the applicants) are involved in trade. This means that the business plan will showcase that there is actual trade or trade that will be conducted. Trade items can include goods or services, International banking, Insurance, Transportation, Tourism, Technology, and new gathering activities among other things. See 8 CFR 214.2(e)(10) for other example and discussion. The business plan writer in an E1 Visa business plan should also show additional qualifications of the applicant. These additional qualifications include that the applicant is of the same nationality as the employer overseas in the treaty nation and that the employee meets the definition of employee under the laws. Also the business plan writer in an E2 Visa business plan should show that the employee is either engaged and/or has the duties of an executor or supervisory character or if employed in a lesser capacity has specialized skill or special qualifications. Special qualifications can include a degree of proven expertise in the employees area of operations or wether the employee has specific skills for trade. Other factors that may be considered when determining wether there are special qualifications include the salary that the special qualifications command and if the skills and qualifications are readily available in the United States. Knowledge of a foreign language or business practices of a foreign country alone do not qualify as a specialized skill but rather enhance the qualifications and E1 treaty Trader visa application. when writing business plans for clients of attorneys in the United States or abroad. If you are looking for a professional visa immigration business plan writer then look no further. Contact Nicholas Coriano today at 203-685-0346 (text or leave a message). Or email today by clicking here.